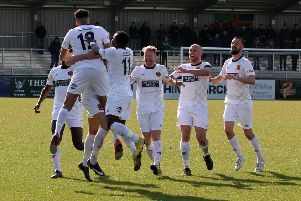 Dave Hoole says he and his Matlock Town squad are ready and prepared for the new Evo-Stik NPL Premier Division campaign which kicks off on Saturday. It will be Hoole’s first full season in charge at the newly named Proctor Cars Stadium having taken over with striker Shaun Harrad as assistant initially in a caretaker capacity for the final month of last season before being appointed on a permanent basis during the campaign’s final week. Matlock’s first challenge comes from the visit of Lancaster City (3pm) who they beat twice last term, winning 2-1 at the Giant Axe and 4-3 in Derbyshire. Matlock’s pre season programme ended with a 1-1 draw and a penalty shoot out win at Belper to retain the Caroline Melbourne Cup, but Hoole was more concerned about his squad picking up injuries from a rough encounter just seven days before the start of their league campaign. “It was feisty and I told the boys we had to come out of the game injury free,” he added. “I wasn’t happy with what went off on the field, we lost Jordan Chappell with a bruised calf and I didn’t want any further injury problems from the last friendly game. Hoole expects Chappell and Ted Cribley who has had an ankle problem to recover in time for the big kick off. He believes the NPL Premier Division will be as tight and competitive as ever and Lancaster will provide a tough challenge. “It’s always good to be at home on the opening day and it would be good to see a big crowd on Saturday,” he added. “The support here has been tremendous in the last couple of seasons and we hope that continues. “We’re expecting Lancaster to be a strong well disciplined and fit side but it’s what we do that counts. I think it’ll be a season when we see that all of the teams are capable of beating each other and I’m confident that our style of play will excite people. Matlock have added to their squad this week with two former Chesterfield youngsters signing on the dotted line. 22 years old striker or midfielder Charlie Dawes is back with the Gladiators for a third spell with eighteen years old midfielder Jack Brownell following him in midweek. “Both Charlie and Jack, along with Alex Hurst who signed last week have worked really hard and deserve a crack of the whip. We’re pleased to have them on board,” Hoole added. The Gladiators travel to newly promoted Scarborough Athletic on Tuesday for their first away fixture. The Seadogs were runners up to South Shields in the First Division North last season and have former Matlock manager Mark Hume as assistant boss to Steve Kittrick. Meanwhile Matlock’s groundsman Richard Lomas has been recognised for his work with a brace of awards. Lomas was named as the NPL’s runner up in the NPL category and he was placed third overall in grounds at Step 3 and Step 4 level nationwide. The NPL winner was Whitby Town’s Eric Wilson. “Richard along with Dave Reynolds puts in a tremendous amount of work on our pitch and last season was really testing for them with the poor wet weather. We’re really pleased Richard has been recognised and it’s a fitting reward for the countless hours they spend on the pitch,” said Gladiators Chairman Tom Wright. Matlock will again be raising funds for the Derbyshire Air Ambulance as on Saturday night a comedy night starring Crich based comedian Terry Woodpecker is being staged in the Shorts Lounge on the ground. Admission is free to the event which gets under way at 8 pm but collecting boxes will be available for attendees to donate. The helicopter arrived within minutes to treat a supporter who suffered a cardiac arrest at the home game with Workington in January 2017, the medical staff’s and spectators’ efforts probably saving the patient’s life.